Long ago, I stopped collecting historic “stuff”. I often stumbled across it or was offered it by people and quickly realized that if I didn't stop I would soon be overrun. My one soft spot, though, is souvenir tableware - things like mugs, plates, cups, especially with centennial or municipal logos. 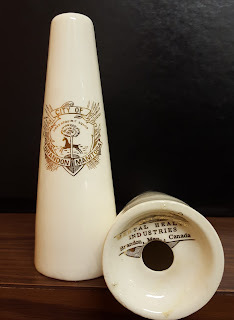 When my friend Kali at Atomic Age Vintage emailed to ask about “Mental Health Industries” of Brandon and if they made things like salt and pepper shakers in the 1960s, I was intrigued and went on the hunt for information. When I saw the logos, I knew I was going to own them. Mental Health Industries was a commercial wing of the Brandon Mental Health Centre, which in the 1960s was called the Brandon Hospital for Mental Diseases. In 1960, under the supervision of the clinical director Dr. W. Schlicter and industrial therapist George Wroblewski, the Industrial Therapy Committee was created at the hospital. The purpose was to provide patients with skills they would need in the outside world and make them a little pocket money. Initially, the committee set up a scrap metal business and a pair of cafeterias inside the hospital and did contract work like repairing burlap bags for the City of Brandon. There were complaints that it took the government-run hospital way too long to return money to the patients, so the Canadian Mental Health Association was brought in as a partner. The non-profit organization handled the bookkeeping. The name of the organization was changed in 1963 to Mental Health Industries, (MHI). By this time, they had a large workshop in the hospital and were producing a wide range of items like aprons, plastic goods and ceramic ware. 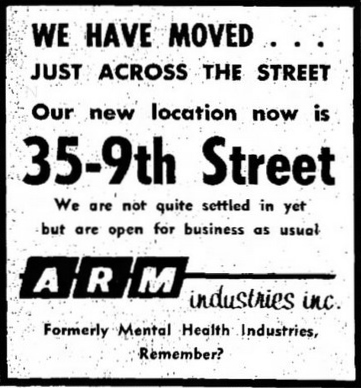 On November 5, 1965, MHI opened a storefront retail shop at 32 Ninth Street, across from the old Government Telephones Building. The move downtown seemed to have a dual effect. Not only did it allow for the expansion of the program by making its wares more widely available, it helped take away some of the stigma from the hospital. 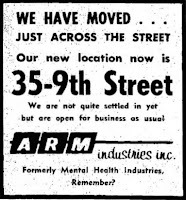 During Mental Health Week, for instance, numerous city businesses took out small ads to sponsor a page for the MHI store and the Canadian Mental Health Association, thanking them for their service to the community. By 1966, MHI had eleven employees plus 200 patients on staff and the workshop at the hospital had increased to 8,000 square feet. Ads for the store listed products for sale such as home furnishings, (step stools, small table and bookcases), souvenirs, (ash trays, paperweights and salt and pepper shakers) and wooden children’s toys and furniture. The number of canteens in the hospital increased to four. The store appears to have been a success. In a 1968 Brandon Sun story, store manager Gladys Brown noted that people drove in from around the region to purchase gift ware and souvenirs to support the cause. 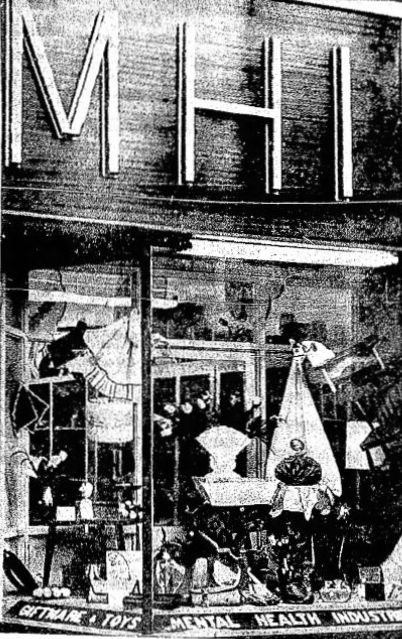 A May 1965 editorial noted that the store made "upwards of $25,000 a year." In the late 1960s, MHI began working closely with an organization called Rehab Industries of Western Manitoba. It was established in 1966 to provide work assessment, training and "sheltered employment" for adult handicapped persons. On April 1, 1971, the two formally merged to create A.R.M. Industries and in June moved to a new retail space across the street at 35 Ninth Street. Initially, they used facilities at both the hospital and Rehab Industries' building on Third Street at Van Horne to create products. Specialties of the Third Street site were printing, silk screening and sign making. The Rehab Industries site was expanded in 1973 and more of the workshop space moved out of the hospital. 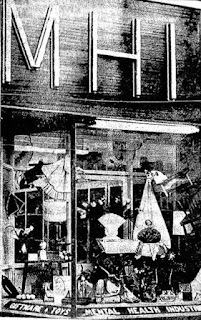 In 1977, the retail shop itself relocated there. Its unclear when the production of souvenir items like the salt shakers ended. On November 18, 1993, A.R.M. Industries of Brandon changed its name to Career Connections Incorporated. My father worked @ BMH from 1957 to 1971 and was involved in this project. As a going away gift he was presented with a ceramic Bison made @ the Rehab Centre. It's still in the family. Thanks for adding this. I imagine there's a lot of BMHC work out there. It would be interesting to see some of the more substantial pieces.